Renowned economist Jose Maria Gay has expressed his concerns with the state of Spanish football, in his annual report on the financial developments in Europe’s top five leagues. Gay feels that Barcelona and Real Madrid are the only two Liga teams that are making steps forward, while adding that the remaining teams have made no progress whatsoever in the past five years. Gay then went on to voice his opinion that the Premier League’s financial model doesn’t have a future either, whereas Germany and France are the example to follow. “The model of the Premier League is bankrupt from a financial point of view. It is based on club ownership, and losses are financed through holding companies. “Football is a true reflection of a country’s economy, and France and Germany are leading the way at the moment,” he stated. Paris Saint-Germain owner Nasser Al Khelaifi has insisted that the Ligue 1 giants have not approached Real Madrid star Cristiano Ronaldo to discuss a possible transfer. The Portugal international recently revealed that he is unhappy at the Santiago Bernabeu side, but Al Khelaifi has made it clear that PSG do not have anything to do with the attacker’s unhappiness. 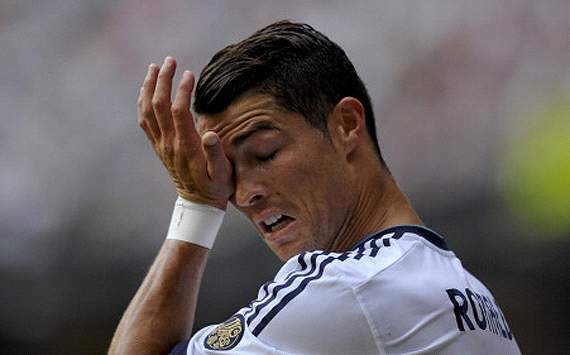 “It’s not true that Cristiano Ronaldo’s unhappiness has anything to do with PSG. If Cristiano is sad it’s not because we’ve been in touch with him. If we were interested we would speak to Madrid first,” he stated to Marca. However, Al Khelaifi did admit that having both Cristiano Ronaldo and Lionel Messi in the same team at PSG is a tempting thought. “Ronaldo and Messi are the two best players in the world and it would be great to have them both in your team. They have a unique charm. I like them both,” he added. Paris Saint-Germain are currently preparing for the Ligue 1 match away against Bastia. What a show we have in store for you this week! Layla Anna-Lee is back to bring you all the latest from the world of football. In this week’s episode, we look back at that memorable clash between Real Madrid and Manchester City with Wayne Veysey, while we invite you to join in with our hashtag game, #footballwrestlers! After the soaring high of Tuesday´s Champions League triumph over Manchester City, it is back to earth with a bump for Real Madrid as they visit Rayo Vallecano. Their neighbours from the working-class district of Vallecas, in the south of the Spanish capital, will be desperate to pull off a shock against their infinitely more illustrious rivals and can be backed at 8/1 (9.00) with to do so. Madrid, meanwhile, are offered at 3/10 (1.33) with the draw available at 4/1 (5.00). Last season Madrid won the corresponding fixture by a single goal to nil, with Cristiano Ronaldo´s impudent back-heel settling a tight contest. Yet of the 11 players that started for Rayo that day, seven have left the club. Their three main forward players, Michu, Raul Tamudo and Diego Costa have departed, with that trio accounting for 34 of the 53 goals scored by Rayo in the league. Though they have made a decent start, the team from Vallecas have been fortunate in both their two matches at home this season, scoring an injury-time winner against Granada, and somehow earning a goalless draw against Sevilla, with the Andalusians missing two penalties. Though the ground is compact and the atmosphere fierce, on the pitch Rayo are a far less intimidating prospect than they were last season. All this points to an away win and it should be more comfortable than many would have you believe. The price of 83/100 (1.83) for Madrid half-time/full time looks like an excellent option, with Madrid showing on Tuesday night just how capable they can be when they play with unity and determination. For some slightly higher odds, back Los Blancos with a handicap of -2 at 23/10 (3.30), with Jose Mourinho’s men talented enough to hand out a thrashing by three goals or more. Turkey midfielder Nuri Sahin has revealed that Real Madrid’s Kaka has already decided on his next move, suggesting that a January exit for the Brazilian looks likely. Currently on loan at Liverpool, Sahin also claimed that Kaka, who has yet to feature this season, rejected a move to Turkey during the summer. “I know he had an offer from Turkish football,” Sahin told NTVSport. The former Borussia Dortmund star then reflected on his own situation, explaining why he chose to join Liverpool. “I went out on loan after three meetings with Mourinho. I chose Liverpool because I wanted to play at a club with a historical tradition,” he said. “I have played at big clubs in Germany and Spain and now I play for the best team in England.